Learning how to deal with Crossroads junction! The definition of a crossroads is where two or more roads cross each other and form an intersection. Crossroads of various types will most certainly be part of the driving test and is a road system that must be thoroughly practiced before taking the test. Crossroads vary from the very quiet residential areas to the hectic multi-lane systems is busy areas.Crossroads can cause confusion for not only learner drivers, but experienced fully licensed drivers are often unsure how to deal with them. Crossroads represent an area in traffic systems where accidents are frequent, hence why you will be taken over a variety of crossroad junctions during a driving test. Crossroads provide an intersection for not only motorists, but cyclists and pedestrians and when all of these converge into one small area, it’s no surprise accidents happen. Gaining an understanding of potential hazards will reduce the risk of an accident and is demonstrated to the examiner by your key observations at crossroads – and examiners will notice a lack of observations if not done. This crossroads tutorial will cover the potential hazards and dangers associated with the different types of crossroads. Crossroads can fail many driving tests due to a learner using them incorrectly, other motorists using them incorrectly and the learner responding incorrectly to their actions, or a lack of appropriate observations. Much of what is covered in left and right turns and road junctions should be applied to crossroads. As a learner driver, it’s important to understand the different types of crossroad junctions as it will allow you to anticipate and deal with potential hazards associated with it. What is an unmarked crossroads? Essentially, there are no road markings or signs to inform motorists that they must give way or to warn of the crossroad junction ahead. Typically found in quiet residential urban areas or on very rural roads. Although unmarked crossroads appear quiet and stress-free, the often offer motorists some of the most hazardous conditions. From the diagram of the marked crossroads, the yellow car is moving along the major road and the red car is giving way on the minor road, wishing to turn right onto the major road. 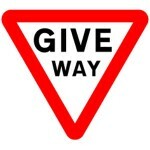 A marked crossroad junction will have road markings warning motorists that they must give way to traffic on the major road and a give way sign may also be present. 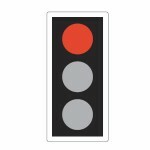 Motorists, cyclists and pedestrians are controlled by the use of traffic lights at controlled crossroads junction. Controlled crossroads are used in busy locations where the use of traffic lights and road markings provide a safer and more controlled system. 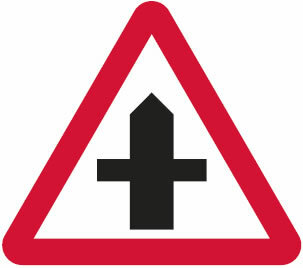 Although these crossroads provide the highest level of control for all, they do come with their own hazards and dangers.Crossroad rules dictate that everyone must stop on a amber or red light. Unfortunately, not everyone obeys these rules – especially pedestrians and cyclists. At a busy crossroads such as the one in the diagram, frequent crossing areas for pedestrians and cyclists are at the corners of the pavements where they cross the road. When the light changes to green, ensure the road is clear of not only crossing motorists, but cyclists and pedestrians before proceeding. Also beware of cyclists emerging from behind as you begin to pull away on a green light and avoid in busy times of day stopping in the cyclists waiting box. Cycle lanes for how to deal with the cyclist waiting box and the rules that apply to them. Some busy crossroads may have a yellow box to aid in keeping the crossing clear. See Box Junction for further information on how box junctions work and the rules that are applied to them. Due potential hazards and dangers associated with crossroads, it’s important that you locate a crossroads as early as possible and avoid having to deal with it in minimal time. 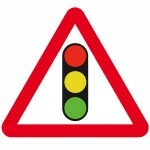 One of the biggest driving test failures is due to junctions / crossroads which stems from locating them too late which creates various problems. If on quiet residential streets, keep in mind that unmarked crossroads are common. 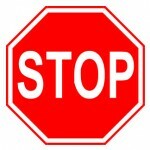 On busier roads, always keep looking ahead for junction or crossroads signs. Looking well ahead you may see traffic lights which may provide a clue to a crossroads. Traffic crossing across your pass up ahead is another clue as are road markings and hazard warning lines. Whilst learning to drive you need to establish and learn the different types of crossroad junctions in advance before you arrive at them. 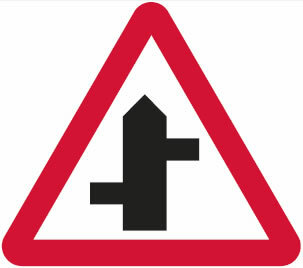 Approaching crossroads should be done in the same way as approaching junctions by using the M,S,M (Mirror, Signal, Manoeuvre) or M,S,P,S,L driving routine. for further information on the correct procedure for the use of mirrors and signals at junctions and crossroads. A signal is not necessary when following the road ahead at a crossroads, although mirror checks should be applied. 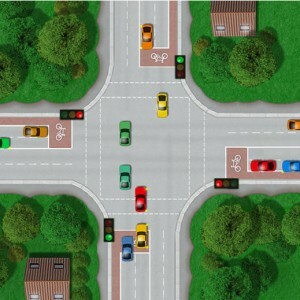 Crossroads rules are similar to those of left and right turns and T-junctions. If crossing another vehicles lane, the other vehicle will have right of way unless stated otherwise by signs, signals or road markings. If turning right at a crossroads and a vehicle directly opposite is also turning to their right, you will need to decide whether to turn behind or in front of them. This is referred to as nearside or offside. Crossroads can occasionally be confusing and knowing which lane you need to go in a certain direction can seem almost impossible. Whether learning to drive, on the driving test or when you have passed the driving test, never panic. Always take the same action as you must on the driving test. 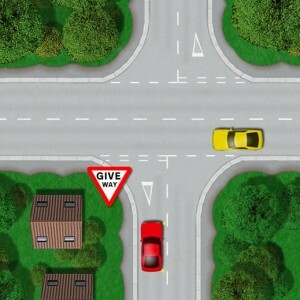 On the approach to a crossroads, the driving examiner will for example tell you which turning or exit they want you to take and they may ask you to ‘follow the signs for-‘. If you find yourself in the incorrect lane, try by use of careful observations – including the blind spot and signals to gain position into the correct lane. If you are unable to do this because other vehicles are in the lane you want or there is simply not enough time to change lanes safely, remain in your current lane and the examiner will simple take an alternative route. The driving test isn’t a test of navigational skills, we all take a wrong turn sometimes. Providing you do everything safely and legally even if it means the wrong lane, you will not fail the driving test for doing this. Below are the various signs and signals that are used to tell motorists a crossroads junction is ahead.